Having been to some of the finest restaurants in the world it takes a lot to ‘wow’ A La Scott. 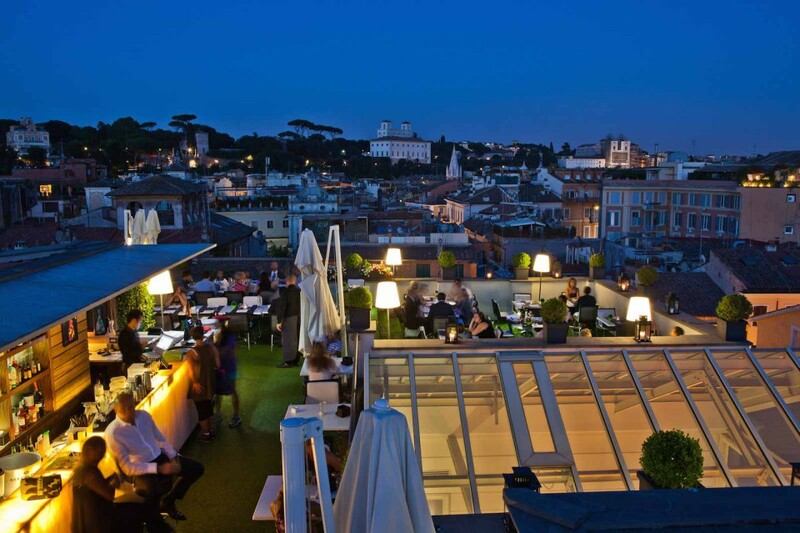 La Terrazza Dell Eden in the heart of Rome does just that. 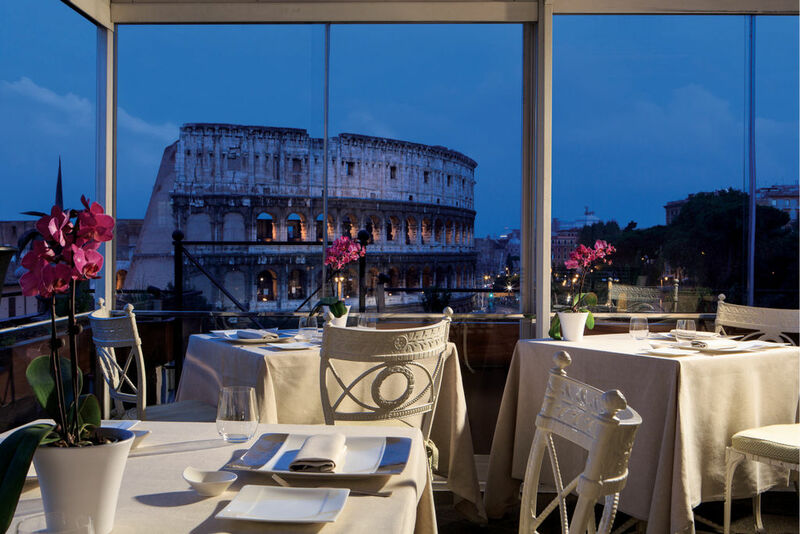 From the spectacular panoramic views of Rome and Vatican City to elegance and culinary perfection Executive Chef Fabio Ciervo brings to the gourmet menu–this rooftop dream is an experience not to be missed. I whole heartedly recommend the gourmet menu with wine pairings. The dishes are creative, well presented and mixes wonderful complimentary favors. The wine pairings are smart and bring out the best in every dish served. The sliced marinated scallops with mango and passion fruit vinaigrette, celery sorbet and Kaluga caviar was a smooth, fresh start to dinner. It’s pairing with a 2012 Longino Cardinal Riesling, Montiggl, complimented the dish well-it being smooth and crisp unlike few Reislings I know. The second course of Goose foie-gras with its supreme, rhubarb and Sauternes wine chutney made my pallet dance from the fine mixture of richness mellowed by the ever so slight tartness of the rhubarb. The delightful wash of the crisp and ever so sweet Reselling likewise complimented this dish well. The third course of porcini mushroom gnocchi with king prawns and their broth had a slight element of heartiness but like the two dishes before it, also had a mellowing aspect to it. For this dish it was the broth. Accompanied by La Foa Colterenzio 2011 Sauvignon, this course was quite well rounded in its flavors. The forth course boasted a fillet of turbot, cous-cous flavored with tarragon, citrus compote and pomme Dauphine (crisp potato puffs). Interestingly the flavors of this white fish were highlighted and made crisp and fresh by the addition of the tarragon and citrus compote, dressing up what could have otherwise been bland quite well. The La Foa Sauvignon followed suit for this course as well. The fifth and most hearty course consisted of roasted medallions of veal, it’s raised shin, seasonal black truffle and lemon grass broth. This hearty dish with some strong flavor mixings was extremely well rounded likely as a result of the truffle and broth overlay. Never sacrificing on flavor, this dish was only made more outstanding by just the right amount of truffle and broth. The 2010 Sangiovese, Cabernet Sauvignon equaled the hearty passion of the dish served. Having been brought to this zenith-the deserts both cleansed the pallet and delighted with unusual and sweet flavors. Sherbert ice, Tanquery Ten gin and lemon from Amalfi coast apricot and rosemary tatin accompanied with its sorbet, caramel sauce flavored with rosemary shows how thoughtful this dessert plate really was. From light and soothing to engrossing and sweet-all bases were covered. And speaking of sweet the L’Eeru Passito, firrato added that final and perfect element of a sweet and pretty perfect end to this fantastic dining adventure. This rare experience from start to finish is incredible and worthy of much praise. For A La Scott this is as close to a five star review as I can ever imagine giving and would go back to Roma just to do it all over again. 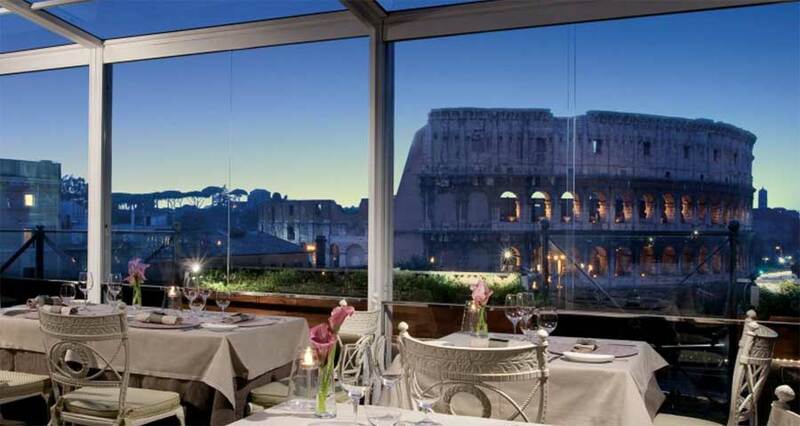 We made a reservation for dinner about a month before we arrived in Rome. I’m not sure about reservations for Appertivo. Enjoy your holiday. Get quick answers from La Terrazza Dei Papi staff and past visitors. Hello, Do I need to make reservations to enjoy the Il Aperitivo at La Terraza? Grazie mille. Old school vibe from the very beginning is the onlyway to describe the Esquilino neighborhood. 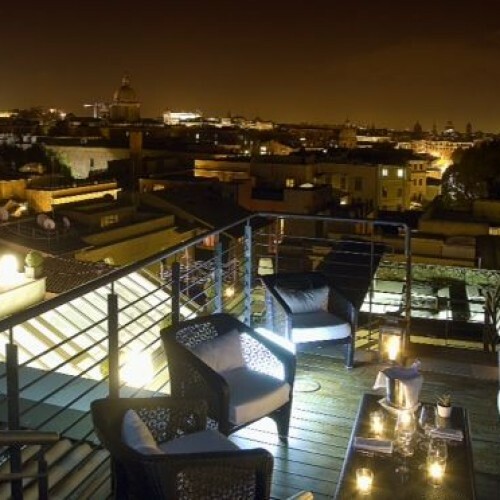 TheEsquilino takes pride in being one of the oldest areasin Rome for its key location on one of the city’sfamous seven hills. What is the price range for a dinner for two at this restaurant? Great food. Not inexpensive but you get what you pay for. 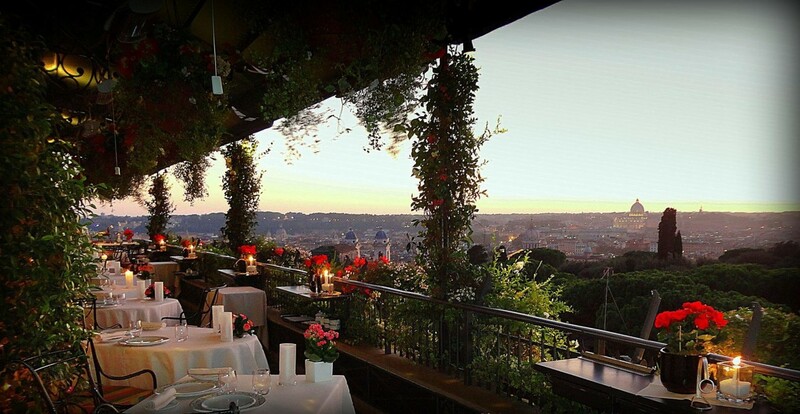 The best view of the city of Roma. 180 degree view of the sun rising in the morning or setting at night. The food is very good. The service is excellent. I would go back anytime I am in Roma. Haute, elegant, and exquisite. This place merits every single star, and Michelin thought the same thing when it awarded it one star in November 2012. 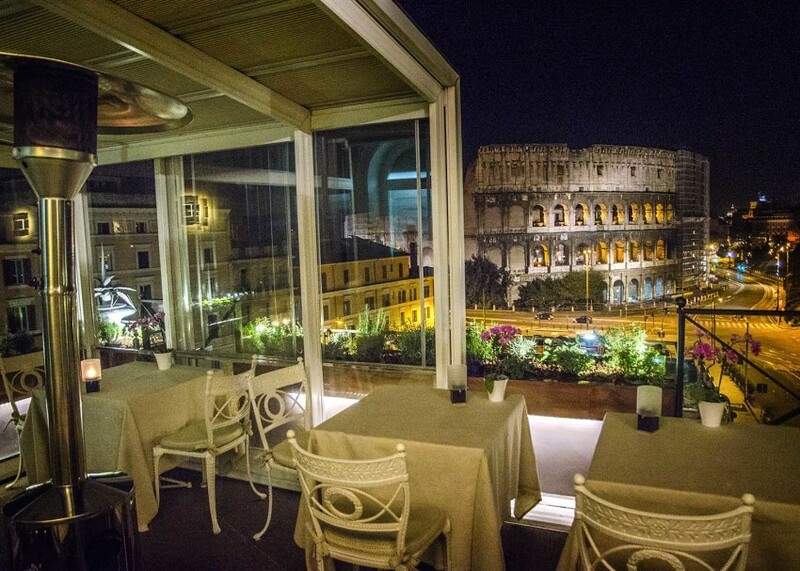 Everything from the panorama – one of the most beautiful I’ve seen after living here the majority of my life – to the classy ambience to the extremely attentive staff to the very last morsel of gourmet food is breathtaking. This place is perfect for special occassions, such as winning the lottery… it breaks bank, but you’re paying for the experience of a lifetime. I dined here with my family and it will be a dining experience I’ll never forget! Complimenti al Executive Chef Fabio Ciervo, abbiamo passato una bellissima serata che non dimenticherò mai. Grazie! What a great way to end a perfect holiday trip to the Eternal City. My husband and I dined here December 29, 2013. 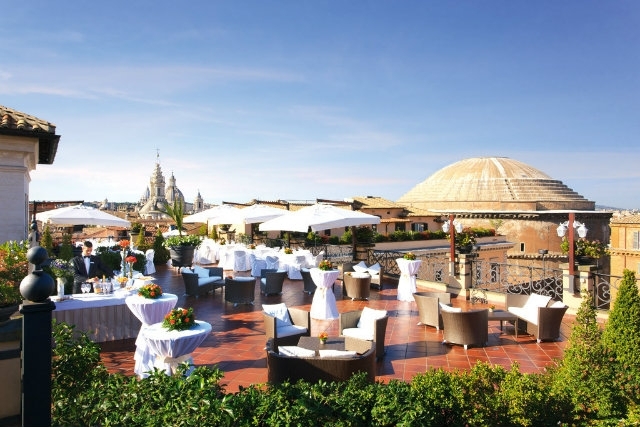 La Terrazza dell’Eden is located on the top floor of Hotel Eden, part of the Dorchester Collection. It is located two blocks off of the Via Veneto and very easy to find on foot or by taxi. 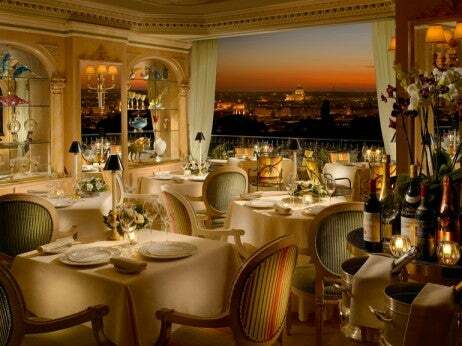 The restaurant is expertly overseen by Executive Chef Fabio Ciervo, and earned a Michelin star in November 2012. 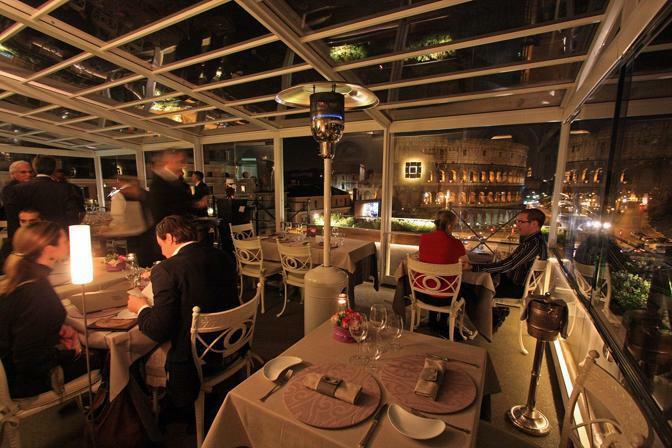 The restaurant offers a panoramic view of the city, which is best seen at sunset…needless to say we did not get to enjoy that as it gets dark at 4.30p in Rome in December and our dinner reservation was the earliest seating: 7:30p. I imagine during the summer months the view is out of this world, because simply viewing the city illuminated in the evening was a treat. The service was top of the line – attentive, courteous, helpful, and friendly. Perhaps our lovely server could have been found to be too talkative to some, but I appreciated his light conversation. I was impressed by the wine selection and the sommelier helped us pick a bottle that would accompany our dinner perfectly (tough as we were starting with lobster and ending with lamb – that’s an easy fix: champagne with lobster!). We did not do the tasting menu as it required the both of us to participate and some of the dishes would not work with my husband’s food allergies. We shared an antipasta (smoked lobster), a primi (I don’t remember, but I know it was good) and a secondi (lamb shoulder – perfection) and couldn’t have been happier. What we ate was irrelevant – it all looked fantastic. Again, I must emphasize how great the service was. Jackets are required. And I love that. I think that enforcing a dress code for a lovely restaurant adds to the evening: “feeling” dressed up is fun and seeing other lovely diners is enjoyable. Terrazza dell’Eden is a *must-do*. 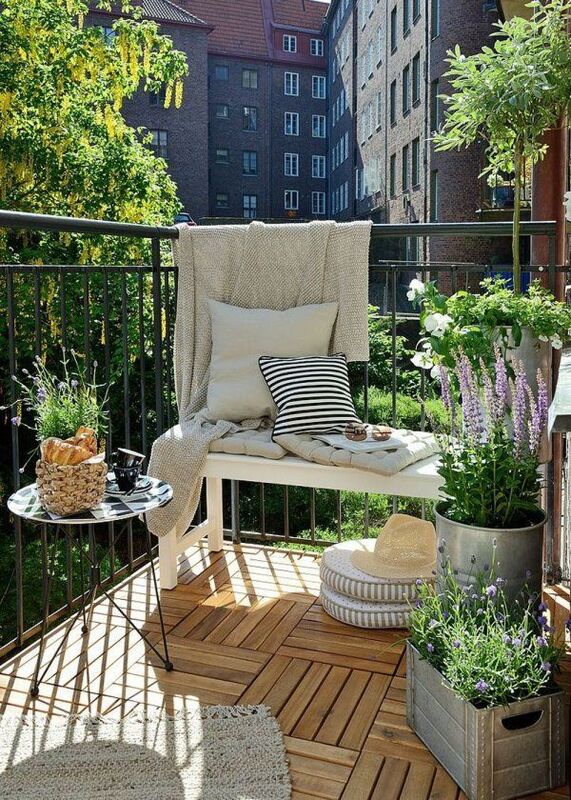 La Terrazza is not available for your requested time. Choose another time, or search restaurants with availability. I’m interested in your gluten free options and cross contamination precautions? basketball games. Look around you: this area isn’tlike the historic center. Liberty architecture, largepiazzas, and long boulevards mix with archaic arches,secret side alleys, and beautiful churches like SantaMaria Maggiore. Is a jacket absolutelly required or smart casual is enough as a dresscode? 5 stars 12 4 stars 1 3 stars 0 2 stars 0 1 star 0 We calculate the overall star rating using only reviews that our automated software currently recommends. Learn more. La Terazza dell’Eden is currently closed for an extensive restoration project. Chef Fabio Ciervo and the whole restaurant staff look forward to welcoming customers back in autumn 2016. Not sure if a jacket is essential, my husband wore one and it is a smart place. 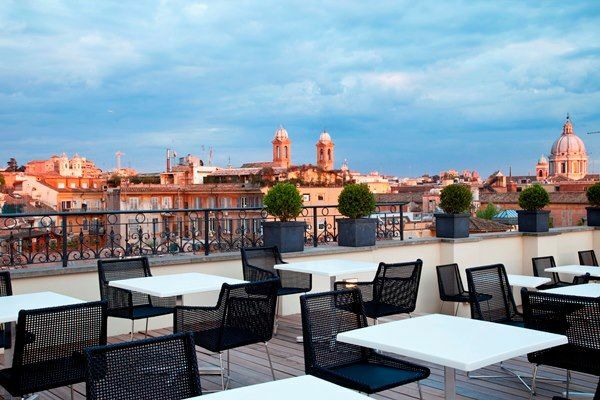 Hotel Eden was our favorite everything in Rome including the breakfast buffet, Il Giardino Restaurant and Bar and of course, La Terrazza. La Terazza is where art, food, and amazing service come together. The staff aims to please and the presentation was shear entertainment. After watching three seasons of Chef’s Table on Netflix, it was thrill to live the dream. Not that the restaurant was on the series but they could be. 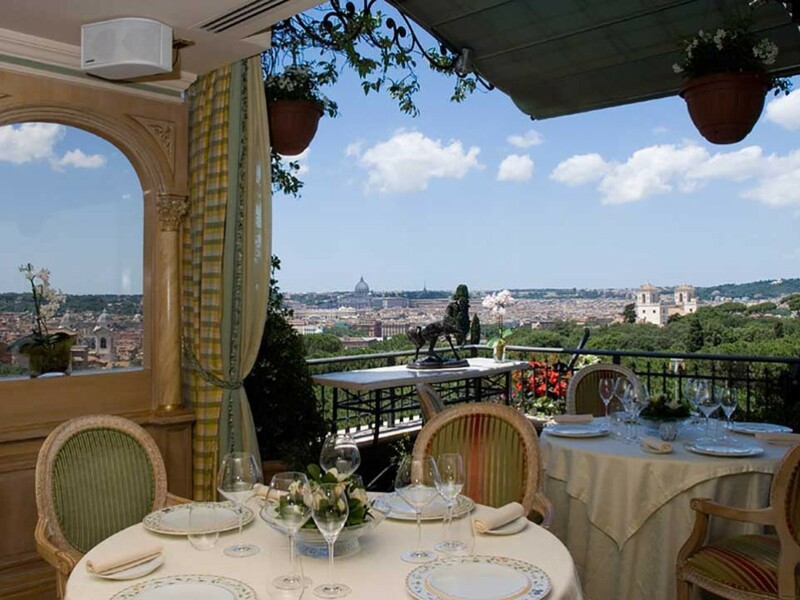 The restaurant has spectacular panoramic views of Rome. Dinner at 8:00 was perfect since we could see the city as the sun set. The city lights at night are just as spectacular. The service was very prompt and attentive, but still allowed us to take time to enjoy each moment of the tasting menu and wine pairing. Even with a full dining room the waiter always took time to discuss each dish and pairing with us. The first course was scallops served with mango and passionfruit sauce and caviar. It was paired with 2014 Jermann Sauvignon Blanc. The second course was goose fois gras with rhubarb chutney and Sauternes sauce. I was surprised when that was also paired with the sauv blanc, but the flavours worked very well. The third course was a spectacular spaghetti dish paired with 2012 Paolo e Noemi D’Amico Chardonnay. What made it spectacular was the rosebud scent that preceded the course. A mist of rosebud scent floods the table and emphasizes the scents of the food and wine. The fourth course was crusted red mullet also paired with the chardonnay. I know some diners were tempted to substitute a more familiar fish, but I recommend the chef’s choice of the red mullet. The fifth course was duck two ways. It was duck breast, duck leg confit with Chartreuse sauce. That was paired with 2013 Girolamo Russo Nerello. My wife is a huge fan of duck and this was perfectly served. This was also the highlight of the wine pairings! The desserts started with a duo of granitas The first was tarragon and the second was martini inspired. These were served with moscato d’asti. The next dessert was an Amalfi lemon cream. That was followed by a yoghurt, milk and lemongrass sorbet. We finished with coffee and assorted chocolates. It was a great night of wine and food, surrounded by spectacular views and delivered with impeccable service! . La Terrazza Dei Papi is not available for your requested time. Choose another time, or search restaurants with availability. Amazing dinner! Spectacular views. 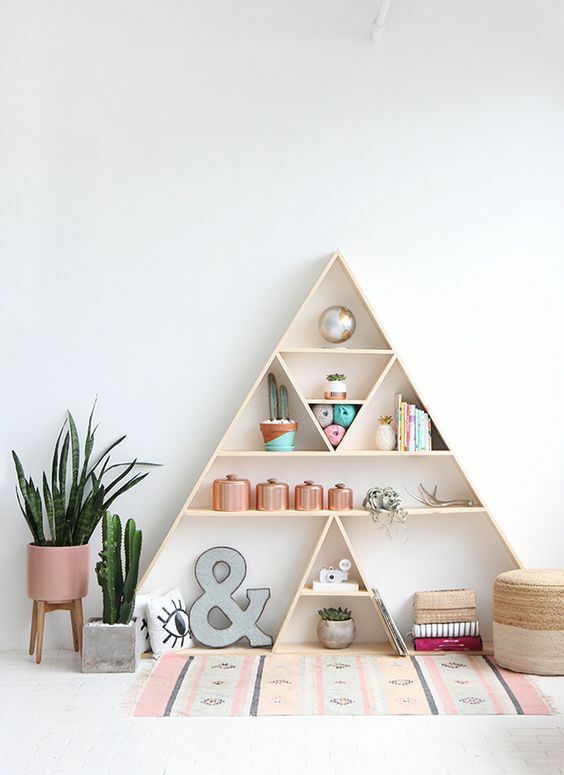 Book reservations for best seating. We had the tasting menu for 140€ each. So delicious. Excellent service. When I commented that I loved the Amalfi Lemon Cream dessert, they brought me 2 more servings without charging us. Maybe they felt bad that a couple with a crying baby was sitting next to us. Who knows? Not a kid-friendly restaurant. That couple was nuts. Very romantic. Excellent service. Fantastic food.